The patented and patent pending HEALTHYSOLE® PLUS System by Detecto is the first clinically proven No-Touch, Hands Free UVC Germicidal, chemical free and Active Disinfection Technology™ to significantly manage the spread of infectious microorganisms traveling on the bottom of shoes. HEALTHYSOLE® PLUS is a new, effective and groundbreaking use of UVC technology that effectively destroys the dangerous organisms that cause Healthcare Associated Infections (HAIs). By introducing HEALTHYSOLE® PLUS into an existing infection control and prevention program, a healthcare facility adds a significant active layer of defense, that once implemented, reduces the rate of cross contamination and doesn’t incur additional labor costs. Lowering the overall microbial burden in a healthcare facility, leads to a decrease of HAIs. Facilities who have positive performance standards by lowering HAI’s, will reduce the additional treatment cost that is otherwise passed to them, shorten extended length of stay for patients, and save more lives. Until now, infection control and prevention programs have been implemented with systems that can’t provide a full and effective line of defense against HAI’s. HEALTHYSOLE® PLUS fills that gap and is the first and only chemical free, hands free infection control product available today that actively works (24/7) and effectively kills up to 99% of exposed deadly organisms on the bottom of shoes in just 5-8 seconds resulting in lower overall microbial loads in key areas of hospitals that lead to the spread of HAIs. HEALTHYSOLE® PLUS’S UVC Germicidal light doesn’t allow pathogens to grow or reproduce and has never caused a superbug or antibiotic resistant organism! The focus of HEALTHYSOLE® PLUS is to kill microorganisms such as bacterial and viral pathogens and also is effective on fungi and bacterial spores that travel on shoe soles that lead to the spread of infection from both surface and air contamination. 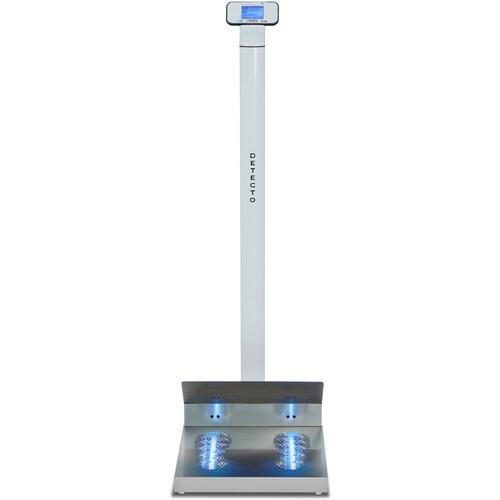 Exposure tests have proven HEALTHYSOLE® PLUS has up to a 97% UVC germicidal light exposure rate to the soles of shoes (Exposure rates will vary depending on shoe style, material, dirt and other debris). Kill rate test results (Antimicrobial Testing Lab). Active disinfection technology and No-Touch Hands Free Our exclusive active disinfection technology, allows occupants of an environment to consistently (24/7) lower the microbial burden throughout the day with no additional workload. No-Touch and Hands Free technology systems are a method of disinfection that does not incur additional labor cost and is less likely to cause cross contamination than alternative disinfectants. Kills organism at DNA level – Primarily by inactivating the DNA (nucleic acids) in microorganisms. By separating the molecular bond in the DNA, the microorganism is rendered incapable of replicating, multiplying, and can no longer cause disease (ICT Understanding the Essentials of Germicidal UV Light 2015). Our Exclusive Patented Plastic Encapsulation Technology™ UVC lamps used inside the HealthySole® Plus are broad spectrum UVC light, shatter proof and self-cleaning. UVC Germicidal light is not visible to the human eye. The visible blue light is just an indication that the UVC Germicidal light is on.